The highlights of tonight's Oscars have undoubtedly been those which speak to more than just the art of filmmaking—they speak to the pressing social issues that the nominated films, songs, and actors so poignantly portray. Patricia Arquette brought the Academy to its feet with her impassioned words about the rights of women. 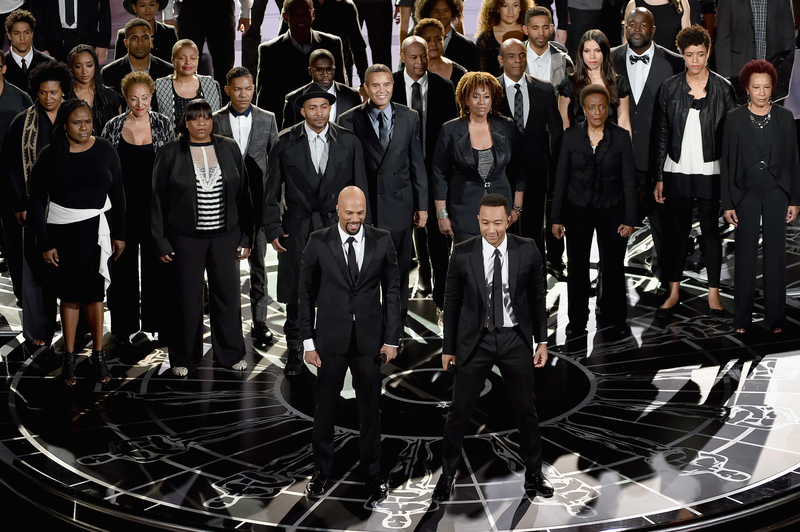 Then John Legend and Common accepted the Oscar for Best Original Song and took the opportunity to discuss the importance of Dr. Martin Luther King's work and how it still applies to the racial inequality which pervades our society. Legend and Common's performance of "Glory" was an unforgettable moment in and of itself, and then their words further brought home the power of the song and of the Best Picture nominee Selma. The beauty of "Glory" was perfectly summed up David Oyelowo's emotional reaction. Those three moments together made a powerful, touching statement on how our past can teach us and help us grow, and fight the injustice we see before us. Naturally Legend's and Common's speech sparked up the Twitosphere with support and admiration of their heartfelt and truly thoughtful words. When it comes to making it count, John Legend and Common just wrote the book on it. Some well-deserved praise for these two incredible people, if you ask me.